In the event of a water landing, your float-tube serves as a flotation device. You know the feeling on the last day of your fishing trip, when you take your last vitamins, the clean clothes have run out, and you have to start packing for the trip home? Then after you get home, the feeling of satisfaction when you unpack and your clothes smell really fishy and you remember how they got that way? Last year I wrote about my trip with 100 Mile Charter to the lakes in British Columbia. (See "No Bears Guaranteed".) I went with three good friends and had a fantastic time. This year, no one was able to make the trip, so I went on my own and had an even better time – but not because my friends weren't with me. Earlier this summer, the Outdoor Channel checked out the cabins and the lakes and had rated them as one of the top 10 trout fisheries in the world. They will be filming a 3-part series in late July featuring the cabins and lakes that Jon Sarver of 100 Mile Charter operates. I flew from San Francisco to Vancouver to Williams Lake on July 1st. Jon Sarver, who owns 100 Mile Charter and the cabins on the lakes, picked me up in his float plane and we made the trip to McNeill Lake. On the way, we spotted 5 moose in two lakes. I love to eat moose. Last year, I didn't get a single fish out of McNeill and this year I caught my first McNeill rainbow – all 3" – within minutes of casting off of the dock and I knew this year would be different. Jon was not comfortable leaving me by myself in the cabins, but I didn't want his family to have to babysit me either. Jon's older brother, Norton "volunteered" to come fish with me for a couple of days. Norton loves to fish McNeill and said that he was happy to join me. The first afternoon, we didn't catch anything but I wasn't skunked because I had caught that 3" fish which, when you are desperate, counts. Second morning we hiked to Lake Catherine (about 10 minutes up and then down the ridge) and I immediately caught a nice 10" rainbow on an orange bodied stimulator. Nothing else for either of us on that lake. We went back to McNeill and Norton rigged up his favorite spinner to show me what could be caught and he landed a very nice fish. We then tried dries and nymphs and nothing was working. Next day, Norton went back to a spinner and I used a green zonker and we trolled and started to catch some fish. Then I switched to a black egg-sucking leach. Norton, who is not new to fishing but hasn't fly fished that much wanted to know why I was changing flies. He thought I must be applying some fly-fishing-logic. You know, fish dark when dark, light when light and all of that stuff. I just wanted to say that I had caught a fish on an egg-sucking leach. And I did. Lots of fish. This was a 30 fish in the boat day. Norton was now with the program – if you can't find out what they want, throw them something entertaining – he used a purple crystal flash egg-sucking leach with a bright pink egg on top. This was one sparkly fly. And then fishing really got hot. We were hauling in 1 1/2 and 2 pounders on a constant basis. Norton couldn't figure out why the sparkly purple was working as he had never tried it before and it certainly didn't look like anything in the lake. I told him I was sure that it had something to do with either the sexual orientation of the British Columbia trout or they had Vegas envy. On the fourth day, Norton and I got up really early and started fishing at 6am. I had my first fish on at 6:10 and it didn't stop until Jon flew in to pick up Norton at lunch time. After Norton left, I tried trolling by myself but it didn't work very well. With the motor and my weight in the back of the boat, the wind just kept spinning me. I tried loading my packed suitcases in the front of the boat but it didn't help enough. Next try was to get myself backed into a little log jam and cast dry flies. This wasn't very productive and, fortunately, I got myself and the propeller out of that mess and back to the dock before Jon came back to move me to the next lake. One of the major benefits of being the only boat on the lake is that you can do pretty much anything and, if you keep your mouth shut, there is limited embarrassment factor. To finish up on McNeill; we never did hike up and up the two ridges to Skinny Lake. It's at least 2 hours each way for me, and I didn't want to waste 4 hours walking once McNeill turned on. When I got up the 3rd morning, I heard some splashing and funny noises from the lake and saw a cow moose swimming in front of the cabin. Norton found her tracks and she had walked the same trail from Catherine that we had, then the wood planks from the outhouse beside the cabin, and then launched herself by the dock. We had moose steaks, moose hamburgers, and moose jerky everyday. I love moose. There are 30 lb lake trout in McNeill. Norton set me up on a spinning rig with a foot long silver lure with 3 or 4 treble hooks and a big weight. We went trolling and I broke off on a log. Jon wanted to know where we broke off as he could jump in and retrieve the lure. 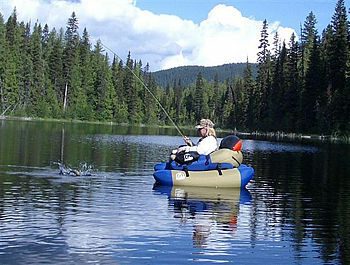 When Norton showed him, he said we had been over the lake trout hole – 150' deep – and had hooked one of the 30 pounders. Jon said that they were big, fat and lazy and sometimes they just held the lure until they decided what they wanted to do with it. The line was old and we broke off before the fight started. Next stop was Lang Lake where the prior couple had surprised a bear on the Lang Creek trail. I asked what happened and Jon said that the guy was as surprised as the bear. When he screamed, the bear ran. I said I could do that but Jon didn't think it was a good idea. Jon's good looking son, Travis, came fishing with me. I asked Jon if he was comfortable with his kids in the woods and he said that they knew what to do. I told him I knew how to scream when I saw a bear. The cabin at Lang Lake is the only one that isn't right by the water. Jon, Travis and Norton have spruced up the cabin. The undergrowth has been thinned out so you now have a view of the Lake from the cabin. There is a new fire pit and benches right by the Lake. The trail has been straightened and cleared of boulders so the cart goes right up to the cabin without tipping over. There are now two bedroom plus two bunks in the main room. And - trumpets sounding here - there is running water. Jon hooked up a gravity feed line from the creek so there is clean, good-tasting water running in the cabin. 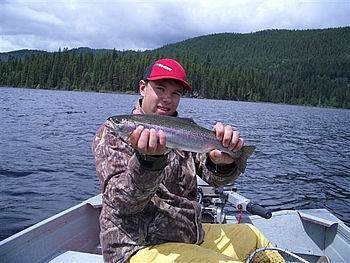 Next day, Travis and I hooked up lots of one pounders trolling both cinnamon and green crystal flash woolly buggers. The fly of choice on these lakes is a red-dot Spratley on an excruciatingly slow troll. In July, the lake trout get lazy and won't move much. Travis hooked up a big one trolling a black and silver speckled spinner but it snapped his rod in two. So we concentrated on the younger fish as fishing for big fish was getting too expensive. Having a yabba dabba doo time, with moose. 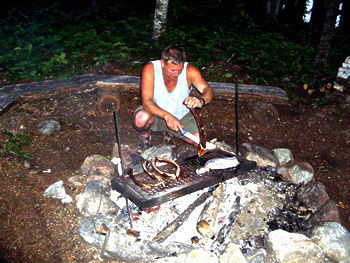 That night, Jon flew in and cooked us moose ribs for dinner. You feel like Fred Flintstone eating these and they are very good. We had moose steaks, moose burgers, moose jerky, and now moose ribs. I love moose. Big rods for big fish. Early next morning we took a trip to the Fraser River to try for sturgeon. You fly west over the Fraser Plain which is mostly forest and lots of lakes. Jon spotted a big old black bear lumbering down a logging road, two minutes later we flew over cattle in pasture, and another couple of minutes put us over Highway 97 that takes you to Alaska. This section of the Fraser River is in semi-dessert. You fly down into the canyon, land and tie up at a sandy beach. 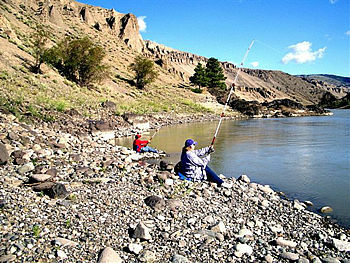 Sturgeon do not like current so you are fishing back eddies with huge rods and reels. We were looking for 7 1/2 - 9 1/2 foot fish. Sturgeon are protected so this is all catch and release with single barbless hooks. The water is opaque with silt so you wait for a bump on the rod. One bump is a salmon, three bumps is a sturgeon holding the lure in it's mouth. Then you set the hook and the fight starts. We got skunked. I told Jon and Travis the trip out and back (especially the landings and take offs) were adventure enough. Watching them fight a big fish for 3 hours wasn't going to be the highlight of my trip. Of course, if it had happened, it might have been. Next day Travis had to go to town to have the cast removed from his leg and I got dropped off at Pendleton Lake. I fished the east end of the Lake and caught 2 fish with my first two casts on one of Rodney Chun's orange bodied stimulators, then decided that it was time to experiment. Pendleton isn't supposed to be very good for trolling but I did really well catching 8 fish using green, cinnamon and black woolly buggers and egg sucking leaches. Pendleton isn't as windy, so I was able to troll and fish by myself without any trouble. Next day Travis was back and hooked up with a 3 pounder on a purple bead head woolly bugger. I picked up a small fish but then we had loon problems. The loons on this lake know all about fly fishing. They sit by your dry fly waiting for a fish or they swim behind your streamer. We were still able to catch fish, but they must have been really stupid fish. A loon took one of Travis' fish before he could get it to the boat. In a one-trout open sleigh. On the last morning, Travis had inflated the pontoon-float tubes and Jon loaded them onto the boat and we went up the Lake to one of the trail heads. It's a very short walk to Lake Sammy if you know where the trail is. We put the tubes in a shallow cove that reeked of moose poop. Not my favorite part of the moose. Jon immediately started hooking up fish and caught at least 70. I caught about half as many with the biggest at 15". All dry flies - they really like the orange stimulators and orange stone flies. We had to quit at 10am so I could make my flight out of Williams Lake. I was standing on the dock as Jon was packing my stuff on the plane. The Lake was so beautiful, I had had such a good time and Jon's family are such great people – I knew I couldn't leave. I had to stay. Then I realized that Jon owned the cabins and he still had to work so I told myself to just get on the plane. There's always next year and I've booked for July 2005. This year's costs were a little higher. 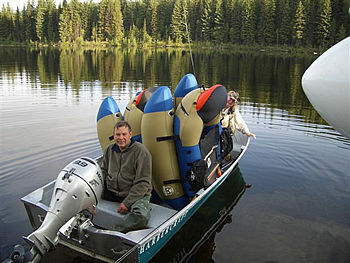 The 9 days including 4 float plane trips between the lakes, 3 cabins, all food, booze, boats and motors at each of the 3 lakes, float tubes and kayaks at 2 of the lakes, inclusive $1,700 US. Side trips to Fraser River or a guided day on another lake would be extra. Jon takes excellent care of his guests. This year it cost $428 plus taxes and fees round trip from San Francisco to Williams Lake. Cab from airport to plane dock is $15 each way. Non-resident fishing license for 9 days was about $80 Canadian.